Chicago’s green thumb just got some international accolades. 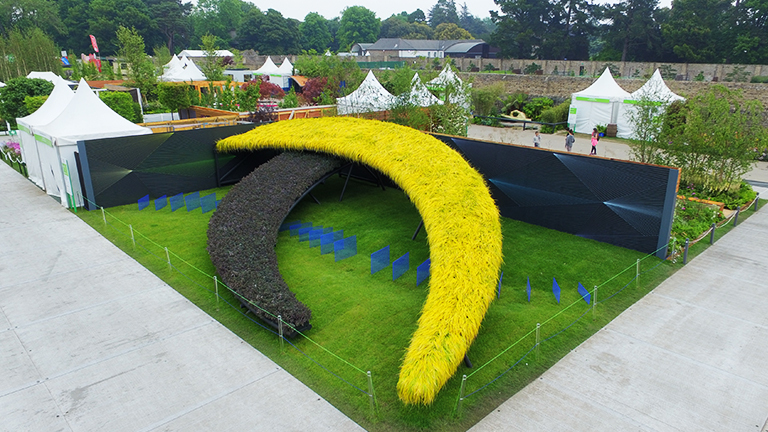 “Bridge the Gap,” a garden designed by the Chicago Park District, won gold at Ireland’s largest gardening show, Bloom, which wrapped up Monday in Dublin. Chicago Park District deputy director Matthew Barrett designed the winning garden landscape, which features two large, living structures resembling the sides of bridges that appear to intersect but don’t. One side of the bridge is composed of steely-blue Sedum plants, symbolizing Chicago’s skyscrapers and steel industry, while the other side features Carex Everillo, a bright green flora representing Irish heritage. Observers on either end of the garden can peer through the gap between the structures to see each other. Barrett's design won one of five gold medals awarded to participants in the “Large Gardens” category at the 10th annual gardening event, which kicked off June 2. “Public art like Bridge the Gap engages the mind and tells a story, allowing Chicagoans to appreciate and be inspired by it,” Mayor Rahm Emanuel said in a press release issued Sunday. Barrett said the Park District represents the first American garden to compete in the event. He said their garden landscape, which spans an area of about 52 feet by 32 feet, likely will be relocated to a public space in Ireland. That site is yet to be determined. May 18: Inside a 12,000-square-foot greenhouse on the Northwest Side of Chicago, thousands of fish – and the waste they produce – are an essential part of an innovative growing method called aquaponics. May 4: How local forest preserves are using fire to maintain the Chicago area's natural ecosystem, much like Native Americans did prior to European settlement. April 26: The giant corpse plant, a titan arum, is now in bloom. See what the plant looks like via the CBG's live stream, and find out about late hours for Tuesday night.